Why does the new manager, owner or C.E.O. decide to “fix” things that aren’t broken—to “clean house” or take a “fresh” approach to everything? Just because (s)he’s the new boss doesn’t automatically mean that everything else has to be new too—new policies, new rules, new subordinate staff assignments, new mission, new doorknobs, new coffee, etc. Yet, with the new assignment and powers frequently comes the temptation to play God and (re)create everything in one’s image—namely, as “new”. Like bulls in china shops, the new bloods all too often manage to spill some as they smash this, trample that, ram through something else, and kick out much of the rest—while creating bad blood among those gored, trampled, rammed and stampeded. But despite the similarities in these “Golden Bull” behaviors and consequences, the underlying motivational drivers may vary considerably. One important aspect of predicting, preventing and managing such Golden Bull behavior is understanding it. God Complex: If you are (a) god, or merely think you are, you are likely to be convinced of your infallibility, omnipotence, omniscience, divine wisdom and omnipresence—or convinced of the need to project all of these—after all, what self-respecting god would lack even one? If these traits seem to encapsulate attributes of gods and some physicians, that similarity is not accidental—since “a god complex” is precisely what gods and many doctors have in common. Translated into workplace terms, being convinced one has those five attributes is enough to trigger a china-shop rampage that creates a swath of destructive innovation in its wake and in the company. Believing one is infallible means prior consultations about the changes that have popped into one’s head are not necessary. The conviction that you are omnipotent welds together the delusions that you are all-powerful and that you have a right to be and behave as such. 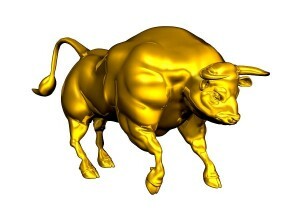 Golden Bulls are very comfortable in the role of the omniscient “know-it-all”. Like God, they can be utterly devoid of humor (which is a natural consequence of being able to predict every punch line). As “know-it-alls”, the Golden Bulls require no advice prior to being unleashed on staff and the workplace. Of course, Golden Bull God-Complex types believe they are wise, which means that in addition to being infallible, i.e., get everything right—including guessing what time it is, in particular they have infallible judgment about what is right, prudent, ethical, smart, etc. Omnipresence—the capacity and inclination to be and to poke one’s nose everywhere—manifests itself as micromanaging and “hovering” over everyone and everything. Upon their appointment, Golden Bulls with a god complex will pose such an imminent and immanent threat. 2. Over-compensation: Just as a great offense can be compensation for a perceived weak defense, Golden Bulls will be inclined to rampage through a workplace, if they fear being seen or in fact see themselves as being too “soft”, “weak”, “indecisive” or “undeserving” in their new roles. Just to make it perfectly clear that they are none of these, they will go to comprehensive extremes and exercise power for its own sake or merely to hang on to it and, in so doing, attempt dispel or preclude any doubts about their fitness for the posting (despite whatever disqualification over-compensation represents). 3. Perfectionism: Even if the new guy (or gal) doesn’t have a god complex or need to over-compensate, (s)he can still be motivated to act like a Golden Bull in a China Shop. One such motivator is perfectionism—in the form of a pre-existing trait or as one spawned by the new job appointment. These two forms of perfectionism are quite different from each other in terms of their pervasiveness, amenability to control and containment, and entrenchment (prior to and during the new power-position). The Golden Bull Prior-Perfectionist will merely expand the scope of his or her perfectionism to include the new job and everything/everyone associated with it. In fact, (s)he may have gotten the position precisely because of extreme perfectionism. However, the Golden Bull Post-Perfectionist (in both implied senses of “post”) will acquire the perfectionism as a precaution or proof of commitment to the job. One key difference between a Golden Bull Prior-Perfectionist and a Golden Bull Post-Perfectionist is that reassuring the latter that (s)he is doing a great job may be enough to put an end to the perfectionist assault on everything and anything in the workplace. However, to get a Golden Bull Prior-Perfectionist to halt the charge will be much harder, if not impossible. In this respect, the task of reining in the Golden Bull Prior Perfectionist may no less daunting than trying to transform a Golden Bull God Complex into the understanding that merely being good, rather than also god, may be good enough. 4. Chaos-phobia: When some people are put in charge, they automatically assume they have to lower their horns, charge ahead and “take charge” of everything, as though they are the glue that keeps everything from becoming unglued (with failure to do so being tantamount to sentencing to the glue factory). This Golden Bull Chaos-Phobia is quite different from perfectionism, a god complex and over-compensation. What motivates a Golden Bull Chaos-Phobic is not the desire to perfect everything, to defend oneself against accusations of unsuitability for the job, or to exercise divine rights and powers. No. The chaos-phobic’s main concern and tacit assumption is that everyone and everything else simply isn’t up to the job of keeping it all together. Such doubts about subordinate and associate staff can have complex psychological roots, e.g., general paranoia about, detachment from and distrust of people and their motives, inclinations or capacities. Chaos-phobia can also stem from an abnormally intense need to feel “efficacious” as an independent agent or from abnormal risk aversion (in terms of either abnormal estimates of the probability of chaos or of the consequences of a lack of anything but 100% control). 5. Kudos-hunger: Perhaps most charming of all Golden Bull breeds is the kind that simply wants to be liked, praised and appreciated, and reassured by having his horns stroked. Because we are almost always praised for what we do, rather than for what we refrain from doing (or, more simply, what we don’t do), the kudos-hungry Golden Bull will naturally assume that the way to garner praise and laurels at work is to do something and to be seen doing it. In its most conspicuous form, that means “making changes”—or, more pretentiously, “change management”, as though making waves is equivalent to making boats. This is a forgivable priority and equation: to be praised=to do. In Shakespearean terms, it seems to be a no-brainer—“To do, or not to do?” That is the question…to which the answer is “to do”, if you want ku-do-s.
Of course, the Golden Bull could be praised simply for doing his job, rather than giving everything and everyone a do-over. But the kudos will be less intense, less forthcoming if all one does is do nothing different. That’s because we humans are in many contexts “difference detectors” to a greater degree than we are “similarity detectors”, reacting more strongly to the one thing that is different than to all the rest that are the same. If we weren’t, probably none of us would ever marry or commit to one job. 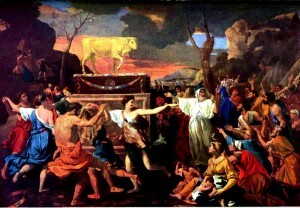 God Complex: If it is clear that the Golden Bull is afflicted with delusions of professional divinity, those affected by his or her decrees have to proceed more cautiously than with the other four types, since, just as is the case with God’s God complex, resistance, advice, etc., will all be rejected as being inconsistent with the Golden Bull’s perfection (which is not the same thing as perfectionism; the latter is the attempt to create perfection in other things, not belief in one’s already achieved and indisputable perfection). When dealing with this type, what is perhaps the most effective strategy is also the riskiest: expose the god’s feet of clay and bring him or her down to earth (and Earth)—or down to clay, so to speak. Well-crafted confrontation may generate enough shock and incipient self-doubt to induce some reflection and tempering of behavior. 2. Over-compensation: To deal with the insecure Golden Bull, consider utilizing a strategy that may also work with the kudos-hungry Golden Bull—praise, reassurance, appreciation. It may work, because over-compensation, as a reactive stance, is very transparent and responsive to subordinate and associate feedback (unlike the Golden Bull God Complex type, who would never deign to consider or respond to feedback). 3. Perfectionism: One tactic worth considering is to use a kind of psychological jujitsu on the perfectionist—use his or her own perfectionism to overcome it. In this instance, that can be accomplished through “meta-perfectionism”, which I would characterize as “perfect perfectionism” achieved by getting the perfectionist to carefully consider the possibility that the attempt to perfect everything may be an imperfect approach. Because this inhibits core perfectionism by stimulating and acknowledging a higher-order perfectionism, it may work. 4. Chaos-phobia: It may be possible to deal with this by providing the chaos-phobic with alternative models and metaphors—ways of seeing and thinking that don’t feature Chaos as the Great Undoer. Viable alternatives include “Invisible Hand”, or, more generally, “self-regulating systems theory”; “pre-established harmony” metaphysics; “self-organizing systems” theory; “synergy”; or “fuzzy-regulation” (the idea that things don’t have to be right to function—approximately right will do). 5. Kudos-hunger: In addition to being the most charming of the five Golden Bull types, this is also perhaps the easiest to deal with. Just give the bull a pat….